We were provided with Mighty Skins Magic Band Skins in order to facilitate this review. All opinions are own. 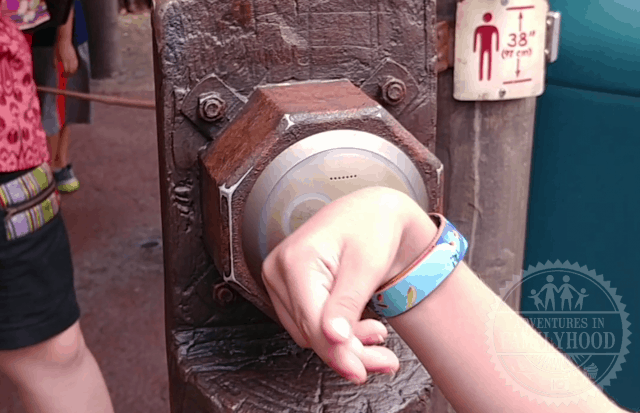 Showing off your personality by decorating your Magic Band has become as popular as wearing matching shirts on vacation. It’s fun coordinating my Magic Band with what I’m wearing to the parks. But as much as I enjoy “disnifying” every part of my wardrobe, I sometimes like my Magic Band to reflect my other interests as well. Thanks to Mighty Skins, I’m able to do just that. Mighty Skins is a company that lets you personalize your electronic devices and more with their adhesive skins. Their Magic Band 2 line offers over 400 designs, prints and styles to choose from. From sports to animals to even your favorite food , you’ll be able to find a skin to match. They even have an option to create your own design. 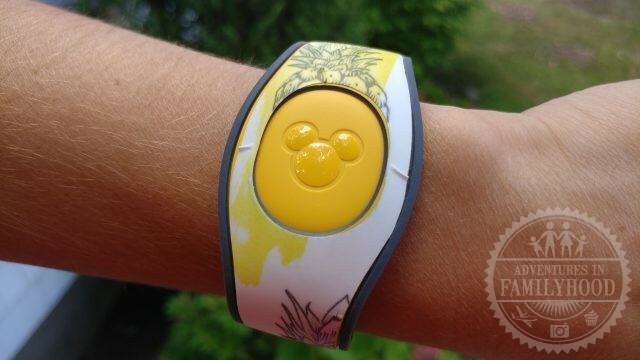 All you have to do is peel and stick, and your Magic Band is a unique vacation accessory. 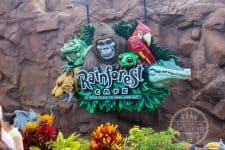 We recently tried out Mighty Skins on our latest Walt Disney World trip. Each of us got to choose a skin for our Magic Band. 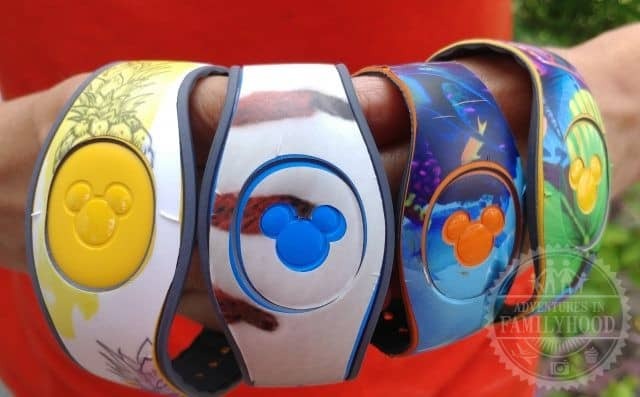 Though we have decorated our Magic Bands for past trips, we had never used skins before. We each got to choose a design that was personal to us. Once we had both our Magic Bands and our new skins, it came time to decorate our bands. We wished that there could have been instructions included in the envelope to let us know the best way to apply the skin to the band. It was kind of a struggle to get the skin on the band without creating wrinkles. Thankfully, it was easy to remove the skin and put it back on before securing it in place. Jackson scans his magic band. We wore our bands with the skins the whole week in Florida through heat, swimming and rain. For the most part, the skins fared pretty well. The only exceptions were the kids’ bands. Since they are more active then we are, theirs started to show more wear as the week went on. Bella’s started to come up on the ends. Jackson’s (that had to be pulled together tighter because of his small wrists) began to crack in places. But both James’ and mine held up very well. Overall, we liked being able to use Mighty Skins to decorate our Magic Bands. We got a ton of compliments from other guests about our bands. They had never seen anything like them before. It’s the uniqueness of the skins that is the major reason to try these out. They’re perfect for Disneybounding, coordinating as a family, paying homage to your favorite ride or just showing off your personality. 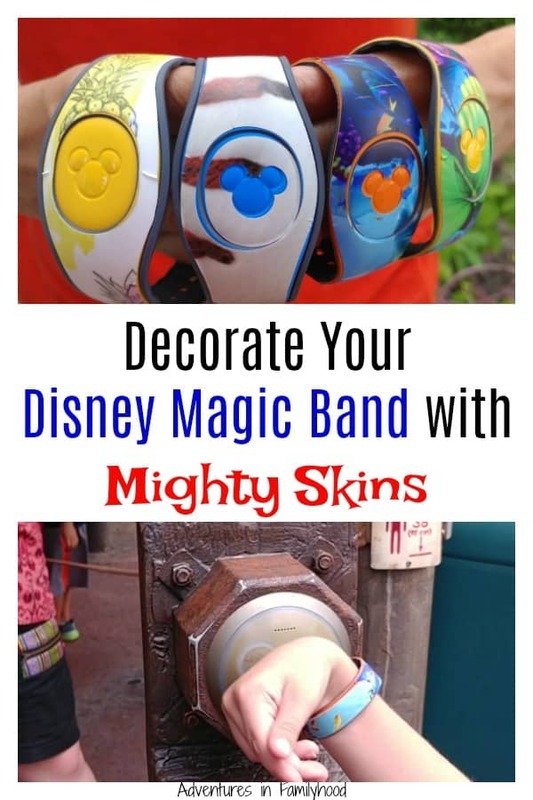 Check out the entire line of Mighty Skins Magic Band 2 skins at https://www.mightyskins.com/disney-magicband-2.